Sunday morning our eclipse party was SE of Grand Island, Nebraska, but weather prospects were not good for Nebraska on eclipse Monday so we decided to make the long trek to Wyoming. Fortunately, my friends John & Nancy Wunderlin had invited us to their eclipse-watching site in Glendo State Park near Glendo, Wyoming. I brought along a Coronado 70 mm Hα telescope, a Meade 8-inch Schmidt-Cassegrain with a white-light full-aperture solar filter from Thousand Oaks Optical, and Fujinon 16 x 70 binoculars, also with Thousand Oaks solar filters, mounted on a heavy-duty Orion binocular mount. While John took pictures of the eclipse, I was busy showing a large group of eclipse watchers views of the partial eclipse before and after totality. During totality, we ignored those instruments and viewed the eclipse using our unaided eyes and unfiltered 7 x 50 binoculars. We had perfect conditions for this eclipse: a very clear sky, low humidity, and reasonably high elevation (~4,700 ft.). This total eclipse was for me more impressive than the only other total solar eclipse I’ve seen: February 26, 1979 near Riverton, Manitoba. It is difficult to describe in words or even photographs the beauty of this event! Definitely worth driving a rented Cruise America RV 2,200 miles and spending three nights in the RV—the night before and the night after the eclipse without hookups, the latter in the Wal Mart parking lot in Chadron, Nebraska. Besides its size, an RV is more challenging to drive than a car or minivan—especially if it is windy—and every time a semi passes you get buffeted. Both hands on the wheel! And then there was the 6+ hours we spent driving from Glendo State Park to Glendo and up WY 319 up to US 18/20—a distance of only about 20 miles—after the eclipse. Traffic was at a standstill most of that time and we really appreciated having the on-board restroom. Despite a huge number of people heading home after the eclipse, it was the most civilized group you could imagine under the circumstances. The kind of people who make the effort to put themselves into the path of totality are probably more intellectually curious and courteous than your average American. We were all still basking in the afterglow of totality, I’m sure. There are so many aspects of the eclipse to describe, but I’ll focus on just a few here. First, I had the equipment all set up before first contact, which is the point at which the disc of the Moon first touches the disc of the Sun, and the partial eclipse begins. Likewise, none of the equipment came down until after last contact, when the Sun once again became completely uncovered. We watched the entire eclipse intently from beginning to end. Though I was busy tending to the two telescopes and binoculars and answering eclipse questions for the wonderful throng of kids and adults who joined us, I did have a chance from time to time to look up at the Sun with the eclipse glasses we all had and frequently used. Paul Martsching saw to it that no one went without their own pair of eclipse glasses. The pre- and post-totality Sun offered up views of a surprising number of sunspots, some very small, and it was interesting to watch them being covered and later uncovered by the Moon. One of the irregular sunspot groups reminded me of a monkey looking backwards over its shoulder. As totality began, it suddenly got darker, and we marveled at the handful of planets and stars we could see. Venus was especially bright. The prominences were a beautiful shade of red and very bright, even to the unaided eye, and in 7×50 binoculars the view was stunning! I have seen many photographs of totality, but no photograph can compare to the view you get with the unaided eye or through binoculars. You just have to be there to experience it first hand. After totality was over and while the Sun was still mostly covered by the Moon, the solar prominences in the Coronado Hα telescope were incredibly bright, brilliantly red, larger and much easier to see than they ever are when viewing the uneclipsed Sun. Wow! When the Sun was about a third to a half uncovered (unfortunately, I didn’t note the time because I was so busy tending to the instruments, listening to eclipse impressions, and answering questions), I noticed a very strange phenomenon in the Meade 8-inch telescope, where the filtered Sun was magnified enough to mostly fill the field of view. A round black bead—a little larger than the largest sunspot—moved along the southwest limb of the Sun from about the 7 o’clock to the 9 o’clock position relative to the cusps. At first glance, I thought it might be a bird or an airplane. The speed seemed about right for a bird, in front of the Sun between one and two seconds, but this black circle moved along the solar limb instead of transecting the Sun! Then, just a couple of seconds later, another black bead appeared, moved along the solar limb, and disappeared precisely as the first one had. That was it. I saw no more. Was this some sort of unusual atmospheric phenomenon? Whatever it was, it definitely wasn’t floaters. As Shakespeare wrote around the turn of the 17th century, there are more things in heaven and earth than are dreamt of in our philosophy. A total solar eclipse certainly confirms that notion. Upon closer inspection, I could see that it was me! 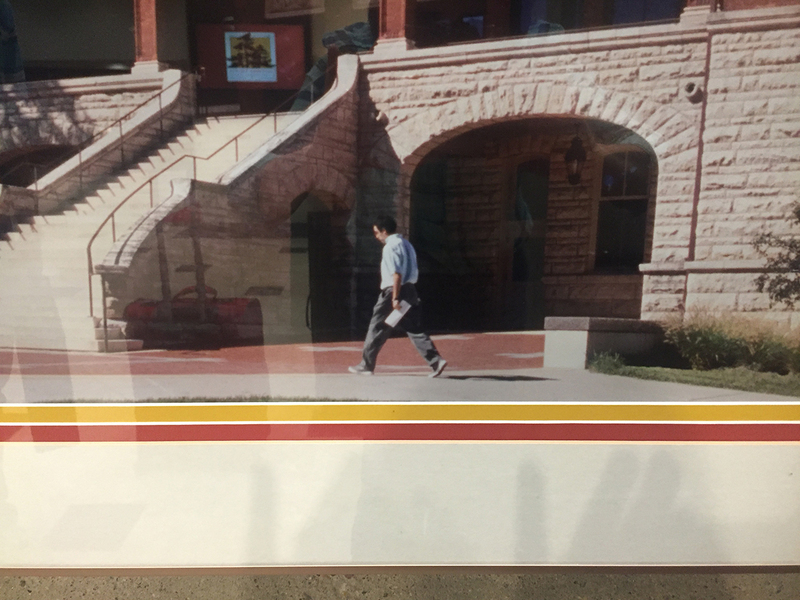 I first came to Ames in 1975 for college and left Ames in 2005, so this photo had to have been taken at some point during those years. 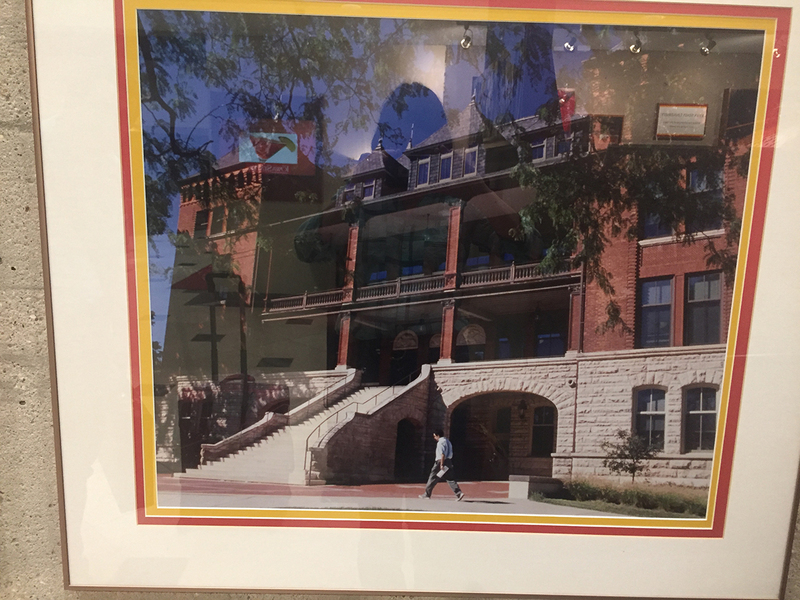 I was walking in front of Carrie Chapman Catt Hall on the Iowa State University campus, and was completely unaware that this photo was being taken and did not know of its existence!